INFINITI informs, in a new ad, that, this NCAA basketball season, the automaker is giving a million dollars to Coaches Vs Cancer. The 30-second commercial, set against an INFINITI dealership, opens with an INFINITI employee in an INFINITI QX50 telling the person at the steering wheel that this car was named one of the world’s 10 best interiors and that “the world’s first BC turbo engine gives you power when you need it” and “fuel efficiency when you don’t”. As the ad goes on it turns out the person he was talking to was actually the mascot of a basketball team. 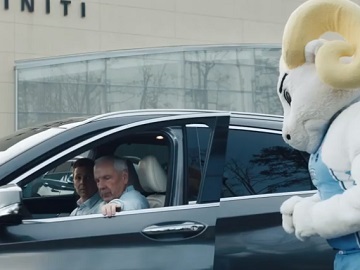 When the coach shows up and realizes the two were about to drive the QX50 without him, the mascot gets out of the car, without saying a word, allowing the coach to get at the wheel. “This season, NCAA coaches are fans of INFINITI. We’re donating a million dollars to Coaches Vs. Cancer,” the voiceover says at the end of the commercial, urging viewers to learn more at infinititimeout.com.